What’s Your Beef – Prime, Choice or Select? 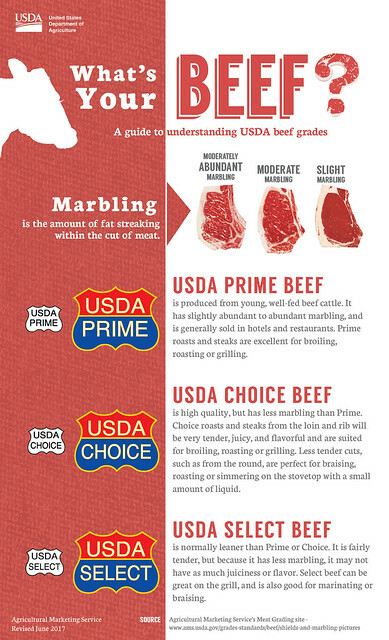 Infographic (click to see larger version) outlining the differences between USDA’s beef grades. The USDA grade shields are highly regarded as symbols of safe, high-quality American beef. Quality grades are widely used as a "language" within the beef industry, making business transactions easier and providing a vital link to support rural America. Consumers, as well as those involved in the marketing of agricultural products, benefit from the greater efficiency permitted by the availability and application of grade standards. Beef is graded in two ways: quality grades for tenderness, juiciness and flavor; and yield grades for the amount of usable lean meat on the carcass. From a consumer standpoint, what do these quality beef grades mean? Prime beef is produced from young, well-fed beef cattle. It has abundant marbling (the amount of fat interspersed with lean meat), and is generally sold in restaurants and hotels. Prime roasts and steaks are excellent for dry-heat cooking such as broiling, roasting or grilling. Select beef is very uniform in quality and normally leaner than the higher grades. It is fairly tender, but, because it has less marbling, it may lack some of the juiciness and flavor of the higher grades. Only the tender cuts should be cooked with dry heat. Other cuts should be marinated before cooking or braised to obtain maximum tenderness and flavor. Standard and Commercial grades of beef are frequently sold as ungraded or as store brand meat. Utility, Cutter, and Canner grades of beef are seldom, if ever, sold at retail but are used instead to make ground beef and processed products. Recently, USDA collaborated with the United States Meat Export Federation and Colorado State University to develop an educational video about the beef grading process. This video provides a comprehensive overview of the beef grading system – from farm to table. very interesting and informative article. thanks. Here is what is left out of this front piece for the status quo of beef production. In addition to more "marbling" i.e., fat - these animals are dosed with antibiotics to keep their failing livers from killing them before slaughter. 80% of all the pharmaceuticals sold in the US goes into farm animals. BigPharma has you in it's grip. Beef cattle are herbivores, fitted by Nature to eat grass. But BigAg wants to feed the world the same diet that is killing Americans with Heart Disease and Diabetes, and etc. Come clean USDA! Our beef production system is an anachronism. Up to 30% of all corn produced is fed to these animals. We don't have a Farm Policy, we have a Money Policy for the benefit of the Chemical Pharmaceutical cabal that owns the USDA and the FDA and your legislators. How long will you stand for this atrocity America? Pictures would be great here! Perhaps a few of the standard cuts and what it looks like on the shelf. I have to explain "marbling" every once in a while, it might be great to have some exaples. Also, there is often a difference between a cut of meat that has a lot of fat on it, vs a cut that has a lot of marbling. I agree with Jerry. Cows are suppose to graze on grass not but forced fed with corn. It's unnatural so the corn makes the cattle weigh more. The fill them with anti-bodies and that goes into our bodies when we eat the meat. All of this in the name of money. It's a shame. We turn our back on the natural way things should be done in the name of money. It's a crying shame. Let's start caring about the health of the people. America is at the bottom of the list of the top 20 richest countries and we have the shortest life span. This tell us all something. good grief? Why is it that the obviously less educated people complain the most? Capitalism will always win in America until we the people stand up against those in power who make the rules. To Loretta and Jerry---the FDA as well as most Gvt agencies cannot come clean! They are too deeply imbedded in the crime! Only the voter and the consumer can come clean! If you don't like second hand hormones buy hormone free food. Grass fed beef is available, buy it! And for goodness sake stop voting for politicians who have sold out to industry. Above all stop complaining, act! Jerry - the only conspiracy involved in "finishing" cattle with corn is the conspiracy of consumer preference. People don't like the flavor and quality of grass-fed beef. Well-marbled beef is more flavorful and tender, and well-marbled beef is grain-fed beef. That's what consumers prefer. You can complain all you like about consumer preference (and you may be right about it), but there is no evil plot on the part of the USDA or "Big Ag". They are just selling people what they want. Thanks Pantrick, you're partially right. We all have to work to make our government responsible but we can't do it by ourselves. Personally I try to make responsible choice for myself and my family. At the same time we should make others aware of the problem too. Yes we should vote for politicians that are sensitive and responsive to our concerns. The problem is you need a magnifying glass to find them. Anymore, it is getting harder and harder to find USDA 'Choice' meat sold in supermarket chains in Southern California. Most of what is offered is 'Select' which is the least tasty and much tougher to cut and digest than choice or prime. It is less expensive, I understand that, but I won't buy it anyway. Am eating more poultry and pork these days. Cut me off another slice of yet another conspiracy theory! Here's a thought, if you don't like it DON'T EAT IT! I will eat steak and drink Crown until they throw dirt in my face. And when they do it will be with one big smile! While you guys are out there looking for the second gunman on the grassy knoll, trying to find Jimmy Hoffa, UFO's and proof that Bigfoot exists, I'll be out there enjoying my life. The funny thing is all the people out there complaining about EVERYTHING are the very ones pumping out children left and right. Man get a life and enjoy what time you have. Sorry, but your big Ag and big Pharma tales just do not occur. I was raised on a Kansas cattle ranch which was homesteaded by my great great grandparents in 1859. We pretty much ran things the same way they did way back then. Cattle graze on grass in the summer with fodder and corn chop fed in the winter when the grass dies back and the snows come. Yes, they get antibiotics, but only if sick and vet prescribed. Last 100-150 lbs of growth they are fed grain to fatten- reason the public wants flavor and marbling so the meat is tender. The public will not eat shoe leather which is what you get feeding only grass. Those who complain about grain fed beef know nothing of cattle and even less of consumer likes and demands. I like a little red meat, once a week to be exact. I'm trying to determine is why do the ranchers feed the cattle Abx so often if the cattle isn't ill? Please explain. I roasted a USDA Prime grade rib roast last night that atually came from a local organic and natural food store. It was conspiracy-free and delicious. Corn fed is delicious. Stop being such babies. Nom nom nom! Linda I also raised cattle for beef. You are like all my lazy neighbors who sit in the house watching fox knows. I hope monsanto kills all of your cattle so you will open your eyes. There is a home delivery service that claims to sell "usda prime". How do I know if that is legit. Do they need to be authorized? I have seen rolls of USDA Prime stickers available online - I could buy them. Sure consumers prefer corn-fed beef, and it only took two generations of manipulation to achieve that...people learned to like the only beef available in stores. It's just like why people like McDonald's...because their conditioned to it. How do you know what grade of meat you're buying (in Arizona) if it's not marked on the package? Shouldn't this be a requirement by law? If a grocery store sells choice beef, are they required to include the choice sticker in the packaging? When I worked in Armour's South St. Paul, Mn. slaughter house in 1969 the meat was sold as Select, Choice, Prime and Hotel Cuts. Is Hotel Cuts a grade or something else? It wasn't for sale then nor now. Hotel Cuts always sold right away and the other grades price was reduced as days in the cooler increased until such time (7 days I think) as it had to be frozen. Is Hotel cuts a grade or just a way separate the best for pricing, and how do I get Hotel Cuts? I can't find it in stores or the few remaining butchers available to the public. If you do not like do not buy it, stop whining. @Rhys, thanks for your question about grade labels. If a product is graded, advertised, and sold as USDA Prime, the packaged product or box must be labeled as such. In addition to the grade or grade shield, the product will also bear the USDA inspected and passed round shaped logo with the processing plant number inside. @John, thanks for your interest in grading. If the meat case, or product is not marked with a USDA grade, then the product has not been graded or is being advertised and sold without a grade. Grading, unlike USDA safety inspections, is a voluntary service; however, if a grade is advertised and sold the product must be of that grade. @Jim, thanks for reaching out. If USDA Choice beef is being sold, the product or meat counter must be labeled with the grade. USDA performs reviews of retail labeling to assure the graded product is being accurately labeled. @David, thanks for the question. Hotel Cut is not a grade of meat. Most likely these products are cut, selected, and trimmed based on more exact specifications (which can include USDA grades) from the hotel or distributor. Will USDA offer grass feed in the future. For those of us who would like to buy grass feed at a affordable price. If you saw a package of "FS" ribeye steaks....what would that mean to you? Also does all meat sold in stores require usda inspection and stamping? Hi Bob - thanks for submitting questions. FS is not a common meat industry abbreviation; however, it might mean Full Service, in that it was designated to be sold through the full service (cut & wrap) section of the retail butcher shop. All meat sold at retail is required by regulation to meet USDA's Food Safety and Inspection Service wholesome and safety requirements and be processed in approved U.S. establishments under strict sanitation requirements. All packages of meat must bear the round USDA Inspected and Passed label which has the plant number inside the logo. USDA grading, such as Prime Choice, and Select, is a voluntary service used to designate differences in palatability, juiciness, tenderness, and flavor. Question for the USDA moderator: If I buy a cry-o-vac "primal cut" and it is advertised as "choice", does it need the USDA shield on the packaging? I purchase such cuts at area warehouse stores, mostly packed by Excel or Swift. Sometimes, the processing companies packaging will merely state "USDA inspected", but the store-applied price tag will say "choice". I have been emailing Excel's customer service, but not gotten a clear response. I was recently served "Bacon Wrapped Tenderloin Steak" purchased at a warehouse supermarket. They were vacuum packed, 1 in. thick, and cost $9/lb. I could find no USDA grading label on the packaging. We grilled them to the "Medium Rare" temp on an instant-read thermometer. The meat was so damn tough, they were all but inedible. Being almost 80 yrs old, I well remember when ANYTHING in the store labeled "tenderloin was 'melt-in-your-mouth' tender. What has happened to the beef industry? @C.R. - thanks for the question. USDA grades such as Prime, Choice, and Select are produced from animals normally 18 - 30 months of age and can be used as indicators of tenderness, juiciness, flavor and palatability. Since there was no grade on the package, the product you purchased was most likely not graded. Some high value case ready packaged cuts such as the tenderloin (filet) from older ungraded animals are used to meet certain consumer preferred price points. As animals age muscle fibers restrict and become more tough, thus cuts from these animals may need to be marinated longer or cooked using low heat to achieve desired tenderness. I bought a New York steak from our local market (Safeway). it says, "USDA certified Tender" on the shield. that is not a grade. What is it? I recently bought NY strips steaks at a local Washington, DC grocery chain that labels certain meats "Butcher Shop -USDA graded" but the actual grade of beef never is specified anywhere on the package. Do USDA grading & labeling regs allow the chain to escape specifying the exact grade they are selling? Recently the local market (Martins/Giant) is selling beef under the name "Butcher Shop". It says USDA and is not graded or give the origin (country). The guy in the meat dept. says they are no longer required to rate. To me that means it must be sub grade of the beef. Lately, here in Louisiana, one large grocery chain is selling "Texas Star Beef", with no mention of grade. Their web site sez, "A blend of USDA Quality Grades, with a marbling score of Traces 50 – Slight 99" What grade is this meat equivalent to? I have been reading all the entries, and have come to the conclusion that it's very difficult to know exactly what I'm buying. After reading an ad for grass fed beef (after seeing someone on Shark Tank hawking his meat company) I decided to investigate what is fed and added to cattle. I wrote to a company who sells beef and ships it frozen, and received a pretty generic reply. The meat is expensive, and tastes great, but like many consumers these days, I'm concerned about unnecessary antibiotics and hormones added to cattle feed. Their response was that the USDA and FDA have determined that hormones are not harmful to humans. They didn't comment on the antibiotics. As for grading, they stated that they only do business with reputable cattle growers, and that their beef is extremely high quality. Since they charge a premium for their product, how do I know if I'm getting an equally high quality product? Can I assume that since it's tender and tastes good, that it's worth the money? It seems like there are quite a few variables to consider! Any comments from the USDA would be appreciated, and help me figure out to get what I expect for my money. MODERATOR: Please confirm or correct the following numbered points. 1A. Meat sold in the United States **MUST** always have the USDA Inspected "circular" stamp with a plant id number inside. 1B. BUT... I am not sure if that stamp has to be on the final "shrink wrapped" meat sold to the consumer or only on the bulk meat when it sold to the butcher. 2A. Butchers may **OPTIONALLY** use the USDA defined grades and if they do so (correctly) then they can label the meat with the appropriate USDA "shield" stickers. Any other meat grading system is not controlled by the USDA. 2B. BUT... nobody forces butchers/meat sellers to use **ANY** specific grading system and use of the plain (stand alone) words "select", "choice", or "prime" is not the same as the phrases "USDA Choice", "USDA Select" or "USDA Prime". Is all of that correct? Have to agree with Patrick here. Regardless of one's personal opinion on the subject, cattle farmers raise, and meat packers sell, what people will buy. If people are so worked up about corn-fed beef, they should start demanding (and be willing to pay for) grass-fed beef at restaurants and supermarkets. Capitalism does work - even fast food places such as Carls Jr are introducing grass-fed beef burgers in markets where they think people will note (and pay for) the difference. @JR - thank you for asking. Please see answers to your questions. 1A. The circular stamp with a plant I.D number, or Establishment Number, is the USDA Mark of Inspection. With a few exceptions, meat sold in interstate commerce will bear this symbol, indicating that it was produced at a federally inspected meat facility. You may also see meat packages with a state mark of inspection or the mark of inspection for an approved equivalent system from another country. As noted below, meat repackaged and sold by a grocery or butcher shop will not always include a mark of inspection. 1B. A mark of inspection will not always appear on product sold at retail if it is further processed. For instance, beef processed and labeled at a Federal establishment will bear the USDA mark of inspection and establishment number when it is sent to a grocery or butcher shop. If the retailer further processes (e.g., grinds or trims) and repackages the product, the repackaged product would no longer bear the USDA mark of inspection. 2A. Correct. If a product is not marked with a USDA grade, then the product has not been graded or is being advertised and sold without a grade. Grading, unlike USDA safety inspections, is a voluntary service; however, if a US or USDA grade is advertised and sold the product must be of that grade. I just went to the local grocery/meat market and bought a whole ribeye USDA choice. Good corn fed beef cut 1" thick and marinating now for a cook out tonight. Mmmmmmm! You can keep your grass fed beef or grind it up for dog food. I raised beef cattle for years and fed them corn. Eat what you want to and I will do the same. The following statement from the above article is FALSE: "Prime beef is produced from young, well-fed beef cattle". According to Hale, Et.Al., at Texas A&M, regarding USDA beef quality grades, "Because the chronological age is virtually never known, physiological maturity is used; and the indicators are bone characteristics, ossification of cartilage, color and texture of ribeye muscle." USDA inspectors do not know, nor do they attempt to determine the age of the carcasses they are inspecting. They inspect the carcasses and determine the maturity of the carcass. Therefore, they cannot describe the carcass as "young", meaning "having lived only a short time". I feel that the above description of USDA Prime as being derived from the carcasses of "young" cattle is untruthful and deceptive. It would be more accurate to state that USDA Prime comes from IMMATURE cattle. However, that would raise questions and wouldn't be very marketable. I wonder in what other ways the USDA might be providing false information to consumers in the interest of "making business transactions easier". For what it's worth, I did buy a USDA Prime NY Strip steak from my local grocer earlier this evening. To me, it was noticeably tastier, with a finer texture than the USDA Choice steaks I usually buy. So, while it would seem that the USDA beef grading system is effective, to ensure qualities of flavor and texture, I do wish that more would be done to ensure methods used to produce the beef. Like many consumers, I am more concerned with HOW my food is produced, than by HOW it tastes and feels in my mouth. I bought a roast yesterday, with a USDA sticker marked 'usda choice'. There was another sticker on the package that said 'prime meat'. What should I take that to mean? the graders don't know to the day the steers age but they do know within certain parameters the general range in age on the carcases they are grading. The grading begins on the ranch when the steers are separated prior to going to market (auction). If any of them were older than a couple years old at the most they'd be tough and hence marked down to a sub Prime grade. To say immature can only be determined by sitting down with each steer and talking with them a while to get a better feeling for their maturity level. Anyone too stupid to take the word of the experts from the literal point of conception to table needs to go to their local auction. Every town in the country has one fairly close by. Buy yourself a calf and rent a pasture from someone there at the auction and take care of it yourself for the next 6-8 months and then butcher it yourself and send it off to be cut and wrapped. It'll either be the greatest time of your life and very educational or it will send you screaming back to your neighborhood from where you never venture more than 3 blocks in any direction to become a life long vegan. A butcher at one of our local stores told us that they are not required to put grade stickers on the meat they sell. Is that correct and if so why did that change?